Asian style art is infused in virtually everything at the top of sales charts, and Okinawa's Colors House is offering its fair share. Colors House, a bright store featuring tee-shirts, clothing and accessories, bags, ornaments and a whole lot more, is featuring the original works of artists from Okinawa and across Asia. 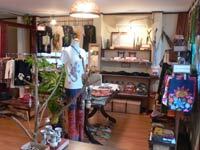 The Chatan Town store has built its trade around the regional artists, who are given room to express themselves, and where customers are free to browse, talk, and make purchases. Since opening last December, Colors House has promoted the historic cultural exchanges Okinawa’s known for through the centuries, accenting everything from awamori, an Okinawan liquor, and bingata, an Okinawa textile that got its start during the 14th and 15th century cultural exchanges with Southeast Asian countries. Colors House has many artists featured who mix traditional and modern Asian styles. Colors House, which offers numerous one-of-a-kind items, is open daily 11am~8pm. The store is located at 223 S-47 Hamagawa, Chatan. Colors House also has a website: http://www.office-bulat.com.